Your willingness to open your classroom to our institution and our students attests to your commitment to the teaching profession and underscores the seriousness with which you assume your role as a mentor and teacher educator. The learning-to-teach process is complex and demanding; deep learning on the part of student teachers depends on the rich opportunities you can provide them within your classroom to experiment, practice, apply, create, revise and question. This website contains resources that are designed to provide you some suggestions, guidelines and basic information that we trust will support the important work you do with our students. 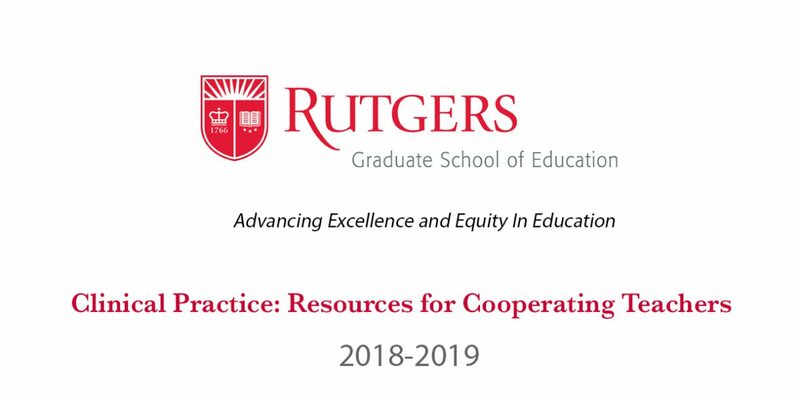 If you have any questions, concerns, or suggestions, please contact Lisa Kruger, Director of Teacher Education, lisa.kruger@gse.rutgers.edu . Connecting educators with the resources to improve teaching and learning is central to the GSE mission. The GSE works with practitioners and scholars to identify critical needs in education and to develop targeted programs to address these needs. This partnership makes the GSE’s education resources—technical assistance, professional development, coaching, and other support services—relevant and responsive to the everyday realities faced by educators, schools, and school districts. The GSE’s outreach and service initiatives are research based and have been field tested to improve pre-K–16 classroom and school organizational practices. Our programs emphasize achievement for all learners, student attainment of state and national content standards, and the preparation of lifelong learners who will be productive members of society.